When Kate from our marketing team got the opportunity to experience an AmaWaterways river cruise on the Danube, she was keen to jump at the chance. The trip was a 7-night adventure onboard AmaSerena, from Vilshofen to Budapest. Countries en route included Germany, Austria, Slovakia, and Hungary. Having never been to these places before, Kate was excited to see the culture and spirit of each destination. Thankfully, with AmaWaterways excursions are included, so she had plenty of opportunities to get to know every town and village on the way. Here’s what she made of her experience of AmaWaterways’ excursions. I found there is plenty of choice when it comes to opportunities and experiences with AmaWaterways. Included tours and excursions were available in each port, or you could also explore at your own leisure, either on foot or with one of the ship’s bikes. The options ranged in fitness level, start time, and activity, from castle hikes and cycle trips to walking tours, and tastings. We opted for the slightly more active excursions including hikes, which also included brief city tours too. The hikes were amazing taking you high above each town for absolutely astounding views, and the local guides were excellent. Here we opted for the castle hike, and I’m so glad we did. It was stunning. From the heights of Passau’s castle, you could see out across the Bavarian and Bohemian forests, and you also had an excellent vantage point for seeing where the three rivers – Danube, Ilz, and Inn – converge. After enjoying the hike in Passau, we decided to go for another one in Durnstein. This hike was just as impressive, though a bit of a higher fitness level is definitely required, on this hike you could actually climb to the castle where Richard the Lionheart was held captive and stand upon the ruins. In Linz, we opted for a morning bike ride along the ‘Culture Mile’, which was an informative and fun way of getting to all the hotspots and sights of the city including the Ars Electronica Center, Lentos Kunstmuseum, the mighty cathedral, and both the new and old town squares. This was by far one of the best excursions! The guide on the coach getting there was great, giving lots of information about the area, and when we finally arrived at the first lake I was truly in awe. After a brief tour we were let loose to wander at leisure, and of course, we had to dip our toes in the beautiful Moon Lake. A few scenic drives and lakes later it was safe to say we were exhausted from such a long and brilliant day. It really is impossible to describe the magnitude of the beauty here. In Vienna, we opted for the ‘active walkers’ city tour, which takes in a few more sights than the gentle group. We had a guided drive on the Ringtrasse where our guide brought history to life with each building! After the tour, we opted to stay in the city and explore for ourselves, from the Cathedral to the Strauss Statue, and plenty of gardens in-between. After some much-deserved strudel, we headed back to the pickup point, where shuttle buses arrived every half an hour to go back to the ship. The pièce de résistance in Vienna had to be the optional Mozart & Strauss Concert in the evening. This was at an additional cost but was worth every penny. Everyone dressed for the affair and the music was sublime, but it’s not all serious - there were a few comedic moments in the performance too. We enjoyed panoramic views of the Wachau Valley as we sailed to Bratislava, whilst listening to incredible commentary from our brilliant Cruise Manager. Arriving in Bratislava, we opted for the tasting and brewery tour where we got to sample three local beers and delicious, traditional Slovakian snacks. When we reached Budapest, we chose to take part in the city tour, to try to cover as much as possible in this beautiful city. In total, we were out for around 4 hours and still didn’t see everything! The Pest side is like a classic cosmopolitan city reminding me of London with a lot of history and character, but a walk over the bridge to Buda is a must as well. This side of the bridge is another world entirely, especially if you head up to the castle. Here you’ll feel like you’re in a fairy-tale, with spires and towers and incredible views. With at least three excursion options every day, it’s clear that the crew at AmaWaterways think of everything. If you’re feeling inspired to get out and see Europe on a river cruise, why not browse through our range of AmaWaterways Danube cruises and see this gorgeous region for yourself. Is River Cruising for You? Over the years river cruising has become an increasingly popular way to see the world, in a relaxed setting. This is evident in the fact that more than 150 river cruise itineraries have been launched in the last 5 years alone. But what is it all about? Read on to find out if river cruising is for you. River cruise ships are much smaller than ocean cruise ships, which is often what attracts people to travel onboard. In many cases the smaller size means guests are more personally catered for, and truly receive that flawless service that you might not get on a ship of over 3,000 passengers. River cruise ships general accommodate between 100-200 people; creating a perfect, intimate experience. The size of the vessel also creates a completely different kind of cruise holiday where destinations are concerned. The ships traverse the world’s rivers, which often pass through integral inland cities, such as Paris, Budapest, and Cairo. On a river cruise you will usually visit a new port each day, and possibly more than one a day sometimes. This means you might visit an incredible four or five countries in just one week, which is very uncommon on ocean cruises. What’s Life Onboard Like on a River Cruise? With fewer people onboard, river cruise ships are generally comfortable and intimate, but with plenty of space for everyone. Usually, you’ll find a restaurant, one or two lounges, and a deck on top with loungers, a bar, and sometimes a pool. Generally all meals onboard are included, complete with complimentary drinks such as wine, beer, and soft drinks at dinner times. Along with those drinks, you’ll often have unlimited coffee, tea, and bottled water. During meal times there is open seating, so you are able to sit where you like each night. Tables are usually arranged to sit between six and ten guests, so you’ll be able to mingle with and get to know fellow cruisers more easily. The dress code onboard is laid back, with no formal requirement. However, it is suggested that you bring at least one smart outfit, to wear at events like the Captain’s reception and gala dinners. You should also bring comfortable shoes and clothing due to the extensive menu of excursions, which range from castle hikes and bike rides to walking tours and wine tastings. Entertainment on river cruises varies depending on the vessel and destination. Most river cruise lines prioritise the destination rather than onboard entertainment, as the itineraries are so port-intensive. This doesn’t mean there is nothing happening onboard however. You’ll often find a pianist playing during cocktail hour and after dinner, and many lines invite local entertainers onboard to provide a culture show of some sort. What Are Excursions Like with River Cruising? Excursions are a huge part of river cruising, so much so that generally all of them are included in the overall cost of the cruise. This is great because often excursions can tally up to a significant sum on an ocean cruise. This is one of the main attractions of this type of holiday to many frequent river cruisers. The excursions themselves are designed to highlight the local culture and history of the port you’re stopping in. So if you are someone who enjoys getting out and about and discovering new things, know that river cruising creates captivating, unforgettable memories with truly insightful opportunities. You could visit a local orphanage in Southeast Asia, go to a cookery demonstration in Africa, or see some important World War II sites on a European river cruise, to name just a few. Why should Ocean Cruisers try a River Cruise? Many fans of ocean cruising will find themselves thinking about a river cruise at one time or another, so here’s why we think you should take the plunge and give river cruising a try. The inclusions in your fare. All your food, free-flowing wine and beer at dinner, and all your excursions are completely taken care of. The size of the ship. Whilst some ocean cruisers love the city-like feel of a liner that can take over 5,000 passengers, we promise you will enjoy the personal service and intimate surroundings of a river ship. There are almost no days without a port stop. You’ll never find yourself bored on the ship with nothing to do, as river cruise ships do most of their travelling at night. The number of destinations. Just about every day you can get out and about and discover somewhere new. With some excursions starting as early as 7am, no time at all is wasted. Would a river cruise float your boat? There are countless top-class river cruise lines sailing Europe, Asia and beyond, including Emerald Waterways, Saga River Cruises, AmaWaterways, and more,so you'll find countless itineraries to choose from. For sailings tailored around a specific country, try Discover Egypt and Pandaw River Cruises, both offering excellent knowledge and guidance throughout their journeys. You can also find out more about first-hand river cruise experiences, with this customer review onboard Emerald Waterways! Fortunately, our very own Jack Lee from the sales team had the opportunity to experience a river cruise with Avalon Waterways, here’s what he thought of the trip. The arrival into Paris was quick, and we were greeted by the transport team who led us to the transfer from the airport to the river cruise port, which was about 45 minutes. Upon arrival to the ship, the first noticeable thing would be that there are only 3 decks. The ship holds 120 passengers in total, the entrance might look small but there is ample space for everyone. The gangway is small, and the ship is not located in a big port. Instead, you are seconds away from getting into Paris city centre when walking from the ship. Once checked in, we were able to go to our cabins and get to see them for the first time. The French Balcony is a very nice sized room; to the left when you open the door is the bathroom with a shower. On the right-hand side is a large mirror, which makes the room seem even bigger, and a large dressing table. The beds are set up as twins, but these can be made into a double if you wanted to. The balcony doors are floor to ceiling and can be opened half way. Avalon Waterway’s dining is set every night at 7pm with around five exquisite courses. If you arrive any later than scheduled you may miss a course, which you aren’t able to request again. Having said this, there are always extra appetisers supplied for passengers in the evening. Drinks like wine, beers and soft drinks are included at dinner and lunch times, but other than dining and lunchtime you will have to purchase drinks. There are many ways to enjoy yourself on the vessel, and when in port you are able to use one of the six onboard bikes to cycle around independently. If you stay on the ship, there is evening entertainment every day, which is held in the main public lounge. On the top deck, there are plenty of sun loungers that you can relax on. There is also a hot tub, which can be very relaxing even in the heat. There is no swimming pool onboard. Passengers usually get together at the nightly cruise director speech, at which you’d find out about the excursions available on the next day. Most are included in your sailing but you can purchase some extra special excursions. The excursions are great; there was one in particular that really stood out for me – the trip to the landing beaches of World War II. We started at Pegasus Bridge where the British invasion happened, walked around a beautiful museum where you learn about the battle that took place there. Next was the crematorium, where the sheer amount of people who lost their lives in the war really hits you. This was such a beautiful and thought-provoking place, as you walk around seeing name after name. Then we went to an area where the British army had come onto the beaches, it was amazing to see some of the man-made piers/platforms. The final part of the tour was a visit to the Canadian landing beaches. Here we went to a museum and watched a video after a tour. The film shows some original footage, and the touching moment of the film comes at the end when it shows the fallen soldiers walking behind you on the beach just outside where you take a walk yourself. Would a river cruise be for you? The option to have almost all your excursions included is amazing, as is the quality of food and intimate style of the ship. Take a look at our range of Avalon Waterways cruises to see where you could explore on a river cruise. 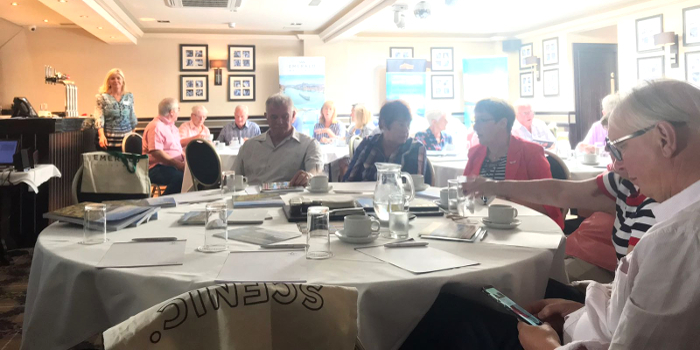 We recently partnered up with Scenic Tours & Ocean Cruises and Emerald Waterways to bring an exclusive event to our Scottish customers, hosting an afternoon tea for 25 lucky VIPs at the Torrance Hotel in East Kilbride, Glasgow. 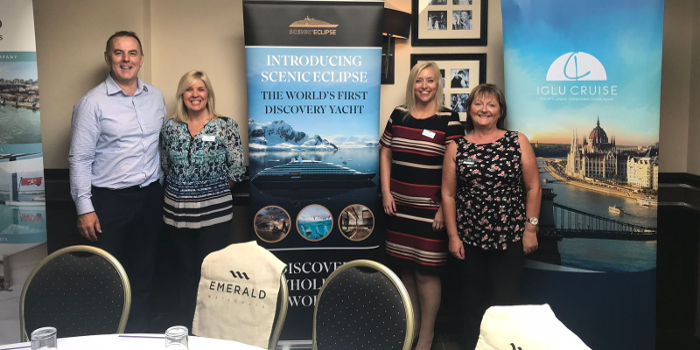 We were very excited to present these cruise line partners to a new area in order to showcase their beautiful ocean and river products, along with the very exciting luxury Discovery Yacht, Scenic Eclipse. Our guests were greeted by the Iglu Cruise team and William Young - a representative from Scenic Tours - in the morning with welcome tea and coffee, starting the day off right. William then gave our guests an informative presentation on each of these two exciting brands. Many of our guests had experienced both ocean and river cruises in the past and were very much looking forward to being introduced to all that Scenic and Emerald can offer – including why they should choose to sail with these brands. The highlight of the day for most of our guests was the introduction to Scenic Eclipse; a stunning luxury yacht. This gorgeous new ship is turning heads everywhere, being equipped with its own helicopter and also a seven-seater submarine that can take guests to destinations previously inaccessible to the ordinary traveller. Many questions were raised and answered, and stories were swapped of previous adventures over a beautiful afternoon tea of delightful sandwiches, cakes, and pastries. All in all, a wonderfully relaxing and informative afternoon was had by all. Thank you to all who were in attendance on the day, it was great meeting you and we can’t wait to see you at our next show. 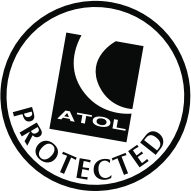 Find out more about all our upcoming events. Some of our lovely customers – Marjorie and Bob Hewiitt – have recently returned from a wonderful European river cruise on the Rhine, with the brilliant Emerald Waterways. Luckily for us they were kind enough to share their thoughts about the experience in this helpful and authentic review. The following comments are honest, and include opinions gathered from the many other passengers who we came into contact with on our cruise. River cruising is a far more intimate affair than deep sea cruising in large ships, and the Emerald Dawn held just 180 passengers as opposed to the several thousand in a deep sea cruise ship. This meant that we not only enjoyed repeated contact with our fellow passengers, but formed good friendships with a number of like-minded people. If anything, however, it was a common view that this ship was a little too large and many passengers reported a preference for smaller ships with say 100 guests. It was clear however that the vast majority of passengers were very happy with the holiday, and with the general management of the ship. In fact we only met one passenger who was unhappy with his holiday, but his main complaint seemed to be that it suffered in comparison with a more expensive experience. Perhaps it would help if I broke down the different elements of the holiday separately. The Emerald Dawn is a relatively new ship, and this showed in the general condition of the fittings. In fact we have to say that it was absolutely the cleanest vessel we have yet travelled in. Everything was sparkling clean from cabins to common areas. Robert, the hotel manager, deserves much praise for his attention to detail and for the incredible attitude of his employees. Bali, our cabin steward, kept the place spotless without being in any way obtrusive. The management of the ship was excellent. The captain and crew were highly professional and provided a smooth and trouble free experience. One, and possibly the greatest attribute, was the incredible energy and humour of Alexander Berger - the cruise director. He seemed to be involved in everything, and kept things moving seamlessly through the day. His commentary on the afternoon when we passed the castles on our way to the Lorelei was very informative and amusing. His two evening events, one a form of dance bingo and the other a game of lies, were a triumph. He really got everyone involved and a good time was had by all. He definitely deserves a high level of praise, as do the staff on the reception desk who worked tirelessly to resolve any query which arose. We thought this went seamlessly, but there was some criticism that we had to spend many hours in the lounge awaiting the message that our cabins were ready. I think many passengers would have spent the afternoon in Amsterdam had they known, but felt it necessary to stay in the lounge until called for. The organisation for getting off the boat was brilliant. Once again Alex was to the fore moving cases from cabin to bus. We went down to breakfast at 7am, and there he was beavering away with luggage; what an asset to the ship, he truly deserves a medal. The general opinion was that the food onboard was excellent. Of course individual customers noted that they had enjoyed better previously, but it always transpired that they were comparing it with more expensive holidays. There was some irritation with the queues at breakfast particularly when a queue for one item meant joining another one for additional items. A little further thought may be helpful if a solution could be found which removed the need to join multiple queues. We coped with this by arriving in good time, and joining different queues with one getting toast and eggs while the other dealt with other items such as bacon and sausages, etc. These are small things however, and I have only mentioned them as the issue was raised by many of our fellow passengers. Overall we thoroughly enjoyed all the meals and found the restaurant staff to be extremely helpful and attentive. In short; full marks for food from us. These were well-organised and very interesting. On the whole the guides were good, but the lady who looked after us on the final day in Strasbourg was exceptional. The coaches were well-appointed and very clean, and the drivers were careful and helpful. The entertainment onboard was relatively low-key compared with the shows provided on the large ocean going cruise ships. Nevertheless, the cruise director Alex did a great job on a number of occasions. A violinist came onboard one day and two classical singers on another. The resident pianist, Benny, did a great job and proved to be a popular member of the team. Given the size of the ship the entertainment was perfectly adequate and once again the cruise director proved his worth. We have enjoyed a significant number of cruise holidays, both deep sea and river. This was one of the best. As we have already noted, the ship was quiet and clean and the staff were ever helpful and courteous. The food was excellent and the entertainment wholly adequate. Our fellow passengers were similar to ourselves. There were no children onboard, a ‘leisure’ option was provided for excursions, there was no abuse of alcohol or any gratuitous noise. All passengers arrived on time for excursions and the whole experience was one of respect and calm. This is definitely a holiday which I would recommend to anyone looking for a river cruise; we have no complaints to report and would be happy to use Emerald Waterways again. In fact, we are already booked onto a cruise on the Douro River next May and are looking forward to that. If Marjorie and Bob have inspired you, take a closer look at the places you could discover on a Rhine river cruise.